The Norrøna Falketind Warm1 Hoodie is a lightweight, soft Polartec® fleece mid-layer hooded jacket made of durable recycled polyester. Part of the Falketind range - Norrøna's lightest fleeces - the Norrøna Flaketind Warm1 Hoodie has a high warmth-to-weight ratio and is quick-drying and stretchy, with other warming essentials for flexibility, comfort, and breathability across mountaineering, trail running, big wall climbing, and glacier travel. The Norrøna Falketind Warm1 Hoodie features a combination of Polartec®'s Thermal Pro® and Power Stretch® fabrics for lightweight warmth with stretch and breathability. Thermal Pro®, even though it appears thick and heavy, uses tiny air pockets that not only trap heat efficiently but also make the fabric highly compressible, allowing it to be stuffed into backpacks when the weather turns or for just-in-case warmth, but does not stop moisture transport. Power Stretch®, designed to last longer than standard elastane materials, is used in the side panels to allow the user to move freely across technical climbing manoeuvres, hard and fast trail runs, or cumbersome big wall missions. An integrated hand gaiter also prevents rain and snow entering the jacket and adds an extra insulating barrier, a soft-brushed chin protector avoids irritation, and hand-warming pockets are there for colder, harsher mountain and winter days. 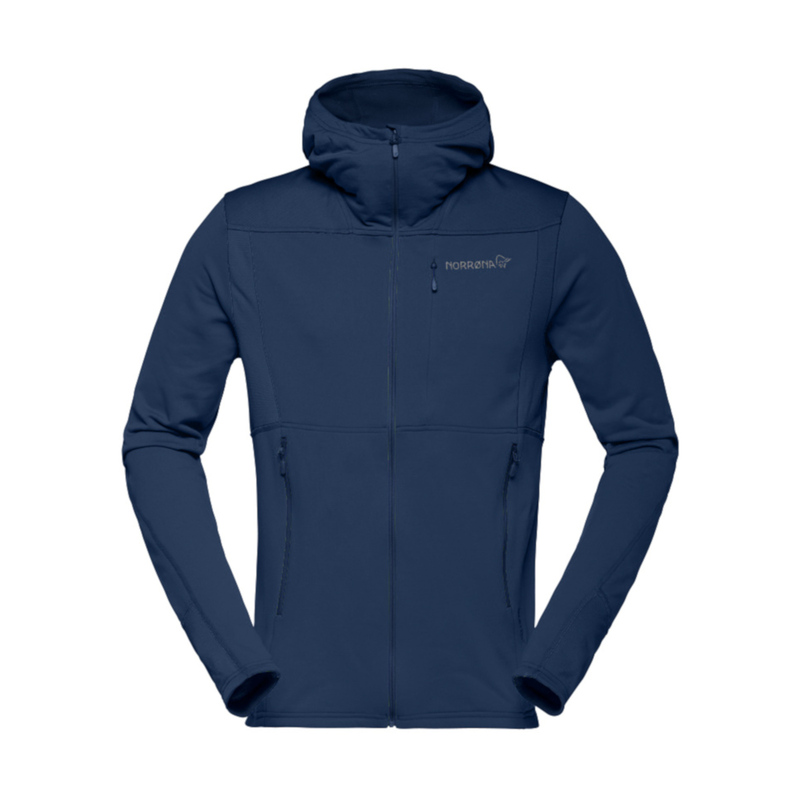 Designed for more intensive days in the mountains and milder days, the Norrøna Falketind Warm1 Hoodie not only insulates but allows the body to breathe and move, so you can feel comfortable and free the entire day. Soft, fluffy material constructed using an innovative knitting technique for high thermal-efficiency and breathability at low weight. Whilst thicker, heavier fabrics provide a high level of warmth, they are also very bulky. Polartec® Thermal Pro® uses long, soft fibres to create tiny air pockets that trap heat and quickly disperse water vapour when working hard. Aside from being lighter, another advantage of this method of construction is that, even though Thermal Pro® looks thick and fuzzy, its low density fibres makes it highly compressible and easier to pack into small spaces. Always made from a minimum of 50% recycled materials. Polartec® Power Stretch® is a thermal four-way stretch fabric designed to be as stretchy as possible without losing its original shape. Elastics are susceptible to wear and tear when overstretched and and after heavy use, but Polartec® use extra resilient elastic-fibres designed to always return to their original form. This means your garment will still fit perfectly after repeated abuse, while still providing all the warmth, breathability, and comfort of Polartec® fabrics.